I hardly can contain my excitement! Down to $3000 we go! I’m using all my restraint to keep from FOMO’ing in. Worried? Not at all, my resolve is stronger than ever before. I’ve been saying we’d be going down still, and $3000 has been a target of mine for a long time now. Now that we’re finally almost here, I can hardly contain myself from FOMO’ing in too early! I’ve been a long-time believer that we had yet to capitulate, and I still think we’re not done yet. My current prediction is that $3000 is almost a guarantee. I still don’t believe we’re going to hit the absolute bottom possible target of $1200 and I actually do think there is a pretty fair chance that $3000 will end up being the bottom. However, I had been anticipating a more negative sentiment by now. More negative, you ask? Yes, truly, even more negative than now. Based on my experiences with the crypto winter of 2014-2015, there’s just still too many optimists and people believing that $3000 will be the moment when we reverse the trend and go bullish again. Sadly, if my experiences count for anything, this is not the case. By the time the true bottom is hit there will be almost nobody still looking to buy. Even I myself expect that by that time I will be hard-pressed to actually pull the trigger and put a lot of money into BTC. And frankly, at $3000 I’m feeling nowhere near the emotion that I just described. Instead, I am anxious to buy BTC at $3000. This has led me to believe that the likelihood of dropping below $3000 is actually bigger than I had first anticipated. To put it quite simply, it would be the thing to finally cause the massive flush-out of weak hands and finally make even the strongest of hands throw in the towel. If we stay above $3000, everybody will be happy and hopeful. But sadly this is rarely the situation in which a bottom forms. Instead, the bottom is where people have given up all hope and despise BTC for everything that it is. It sounds to me that we will need to drop below $3000 in order to reach that sentiment. Technical-analysis-wise, though, it looks like $3000 is pretty strong support. I don’t expect we will fall through it immediately (if we ever do) because of it. A more likely scenario is that we will bounce up significantly from it, because a lot of people like me are waiting on the sidelines for $3000. This bounce will either be the end of the bear market and the beginning of the long and stagnant depression phase (Oh, I didn’t tell you yet how ‘Depression’ is in many ways worse than ‘Capitulation’, did I? Oh gods… the boredom… just hang around and you’ll find out eventually… ). If I had to give it odds, I would say there is perhaps a 40-50% chance of $3000 being ‘the bottom’ and an equally big chance of us dropping below it. Due to this, I plan to accummulate at $3000 as well as keep some ammunition in store in case of further drops to $2000 or to $1200 at the lowest possible point. It’s funny to feel reverse-FOMO like this. 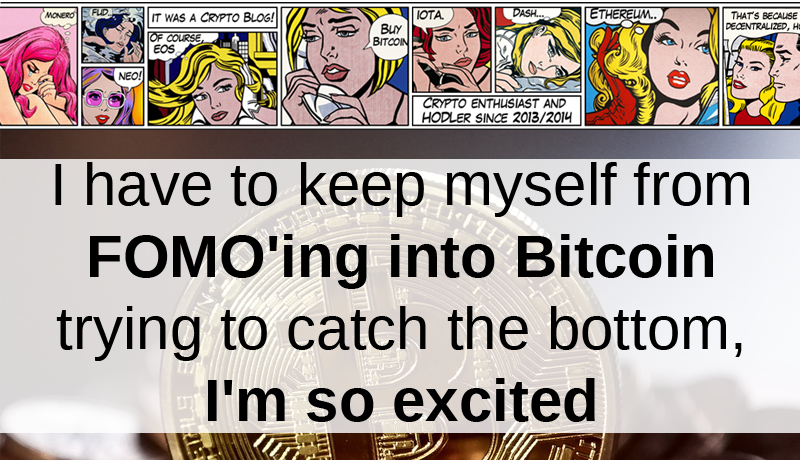 Instead of FOMO’ing in at the top, I am FOMO’ing in trying to catch the bottom. Equally as dangerous and perhaps equally as irresponsible – I would not recommend this to anyone who is not completely convinced about the future of BTC. People who are, in other words, ‘true hodlers‘. And remember, never invest more than you can afford to lose. I guess you’ll know the true meaning of this by now, if you didn’t know it from before already. No matter what, it is a gamble, and at these low prices it is probably doubly so. Please note: Trying out the new mentormarket.io interface, so some issues with formatting or layout may have occurred in this post!